Gold! Gold! Gold! Speeding to Seattle from 1897 to 1899 on transcontinental trains, steam ships, and other modes of transportation, 70,000 gold rushers overran downtown Seattle, now the Pioneer Square National Historic District. Clever Seattle businessmen devised an advertising scheme that attracted gold rushers from around the world like the smell of a home cooked meal lures a starving person. The Klondike Gold Rush to the gold fields in the Yukon of Canada ignited the imaginations of the poor, the wealthy, adventurers, and fortune seekers alike. Downtown Seattle ran amuck with crowds of gold rushers, Seattlelites, dogs, horses, mules, and goats while music spiraled from open saloon doors and nostrils filled with smells of stale beer, animals, baked goods, fried meat, wood smoke, and sweaty human bodies; eardrums vibrated with noises of dogs barking, horses neighing, mules braying, and goats baaing; human voices mingled in shouts and rhythmic hums; con men foisted worthless goods on naïve gold rushers—edgy and intense—buying the year of supplies required by Canada before crossing their borders. 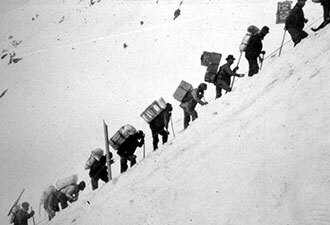 Willingly, the gold rushers spent their own money or borrowed it and hauled, loaded, and unloaded 1,500 to 2,000 pounds of “live or die” supplies again and again until they reached Dawson City in the Yukon Territory of Canada. Today in Pioneer Square, ornate Romanesque Victorian buildings encase in their bricks the smells and sounds of the gold rush years when gold dust, nuggets, and bars passed through their doors bringing prosperity to their owners. 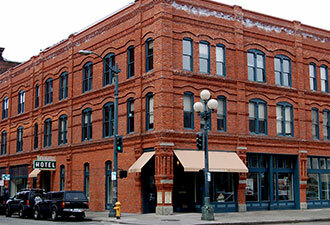 One of the buildings, the Cadillac Hotel, is the home of the Klondike Gold Rush National Historical Park. Rooms in the hotel were available to gold rushers for 25-50 cents per night. Now in the hotel, new exhibits replicate gold rush scenes and follow the experiences of five gold rushers, two women and three men. Step on a large scale to learn your value in gold. In 2009 prices exceeded $1,000 per ounce compared with $15-$20 per ounce in the Klondike Gold Rush years. Spin the big Klondike “Strike it Rich” wheel of fortune to ignite your gold rush fever and learn your fate. Know in an instant whether you will strike it rich or your hopes will be dashed – compared to the months of aching muscles, hunger, and bitter cold the gold rushers endured before they proved they were lucky or not. 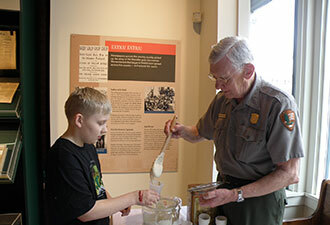 The Klondike Gold Rush National Historical Park offers summer ranger tours of the Pioneer Square National Historic District, junior ranger activities, a speaker series, and special events. To continue the Klondike Gold Rush experience, visit the part of Klondike Gold Rush National Historical Park in Skagway, Alaska and the three Canadian national parks, including its Chilkoot Trail National Historic Site. All five parks make up the Klondike Gold Rush International Historical Park.